Made entirely from steel these beautifully hand crafted levers are not only pleasing to the eye but also comfortable to use. Supplied with a matching thumbturn. Sold as a set and supplied with necessary fixing screws. 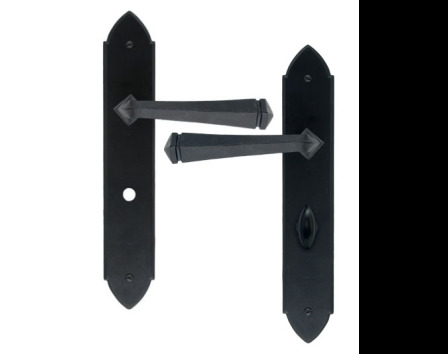 We recommend you use a Bathroom Mortice Lock 2 1/2" or 3". The Gothic Bathroom Lever Handle Set is part of the blacksmith's range of lever handles that is individually forged in steel on an anvil.